RICHMOND, VA (HNN) - 2008 brought us the first “Kung Fu Panda” film which was a wonderful blend of excellent voice acting, gorgeous visuals, and superbly done action sequences. Three years later we have a sequel which delivers in the same areas as the original while giving us a more in depth story, one that becomes more emotionally involving now that we are well acquainted with the characters. The film opens with a quick backstory of the villain, Shen (Voice of Gary Oldman). His parents used to rule a city in China and even invented fireworks, but their son, Shen, found out that they could be used for other, more sinister purposes. A soothsayer (Voice of Michelle Yeoh) informs him that his ambitions will be stopped by a warrior of black and white, causing Shen to order the destruction of all the pandas. This causes his parents to banish him from the city. Now in present day, we find Po (Voice of Jack Black) living his life as the Dragon Warrior with Master Shifu (Voice of Dustin Hoffman) and the Furious Five: Tigress (Voice of Angelina Jolie), Monkey (Voice of Jackie Chan), Mantis (Voice of Seth Rogen), Viper (Voice of Lucy Liu), and Crane (Voice of David Cross). Po is attempting to find inner peace, which can be hard when your life is dedicated to fighting off pirates and bandits, but even more so when an even bigger problem arises. Shen has returned to his parents’ city to reclaim what he believes to be his, but his ambition stretches further than that. He wishes to rule all of China with the help of a new weapon he has created. Now it’s up to our warrior heroes to stop him before he can carry out his plan. As I mentioned, this sequel is more emotionally involving than the first, and that’s because we begin to delve into Po’s backstory. The first film had left us with the mystery of how a goose could be a panda’s father. Well, ok, maybe it wasn’t really a mystery of “how,” but rather who his actual parents were and what happened to them. Near the beginning of the film, Po begins to have flashbacks of the last night he saw his parents, but these are fragmented with several pieces still missing. His dad, Mr. Ping (Voice of James Hong), fills in the small piece he knows which is basically that he found baby Po in a box of radishes in the back of his noodle shop. One of the interesting things that the film does is slowly reveal what happened that night throughout the story which is turn develops the character of Po a little more. Once again, the animation deserves praise. However, aside from the regular animation that is used, there is also a different type used for the flashback sequences. These are both beautifully done and really don’t deserve the dimming 3-D treatment that several theaters are giving it. Luckily, I was able to catch the film in 2-D with all of the bright, vibrant colors intact, so I was able to appreciate all the time and effort the animators took in making this a visual treat. The returning voice cast does a great job once again. Black delivers a lot of the films humor while also giving the character the right emotional touch that is required for the character’s backstory. Someone else that deserves some recognition here is the versatile and always wonderful Gary Oldman. He’s one of the most fascinating actors out there who always seems to be playing someone completely different in films like “The Fifth Element,” “Dracula,” and “The Dark Knight,” but he is also able to bring that same intriguing spark to his animated role of Shen. He’s able to convey the character as a madman (well, a mad-peacock) bent on taking over the country quite convincingly. 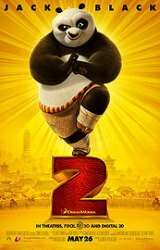 Overall, “Kung Fu Panda 2” is a delight and is well-worth seeing. It’s got everything you could want in a film made for kids including a good story, stunning animation, and a few laughs. Even parents will most likely enjoy the film due to these qualities. It doesn’t go for the split level of humor of other animated films like “Shrek,” but it doesn’t have to. This is a film that is meant for all ages and is one that can easily be enjoyed by all. 3/4 stars.